Many people have come away from their GP’s surgery diagnosed with “Sciatica”, with a shopping bag full of pills to help – but is it always true sciatica? I would say more often than not, it isn’t…It’s important to make the distinction between true sciatica and pain that’s mimicking sciatic symptoms, such as Piriformis Syndrome – because otherwise we miss a frequent cause of pain: our muscles. Muscles receive surprisingly little attention in modern medical school teaching; certainly the most common “treatment” I see nowadays for Sciatic symptoms are Naproxen (anti-inflammatory) and Co-codemol (pain relief). If this does take away the pain, where do we go from there, if nothing has changed? Well, often, we sit and wait ’til it comes back…..
Sciatica, or True sciatica, is caused by pressure on the sciatic nerve at the nerve root. The most common feared cause of pressure is a bulging or herniated disc which compresses the nerve near the lower spine. It is this nerve compression which differentiates it from Piriformis Syndrome, which would be considered a nerve entrapment. If it is suspected that a disc is bulging or herniated, then an MRI is usually needed, but in a high percentage of cases, pain consistent with sciatic symptoms aren’t caused by true sciatica but by chronically tight or imbalanced muscles. This research paper suggest that “…The annual prevalence of disc related sciatica in the general population is estimated at 2.2%“, with “age, height, mental stress, cigarette smoking, and exposure to vibration from vehicles” being common risk factors. Clinically, I would add inactivity to that list (much more so than physical exertion). Most common symptoms are pain, aching, burning, tingling, numbness, or weakness anywhere along the path of the sciatic nerve. This could be anywhere from the lumbar spine through the buttocks, down the back of the thigh, into two branches in the lower leg. Symptoms may occur anywhere along the nerve, from the lower back as far down as the foot. Finding a comfortable position to sit, stand, lie down can be problematic. 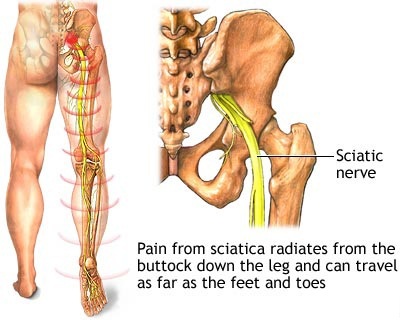 If Sciatica is treated effectively, “most patients with acute sciatica have a favourable prognosis, with only about 20%-30% have persisting problems after one or two years” and that “Staying active, in contrast to bed rest is likely to be beneficial” (Ref 1). Consider a group exercise programme for people with a specific episode or flare-up of non-specific low back pain with or without sciatica. Take people’s specific needs, preferences and capabilities into account when choosing the type of exercise. Consider manipulation, mobilisation or soft tissue techniques (for example, massage) for managing non-specific low back pain with or without sciatica, but only as part of multi-modal treatment packages. As importantly, the recommended do not’s include; belts or corsets, foot orthotics, traction, acupuncture, ultrasound, routinely offered opioids, or spinal injections for managing non-specific low back pain and sciatica. As always, when in doubt, check it out! This entry was posted in Uncategorized on 29th May 2013 by DCInjuryClinic.